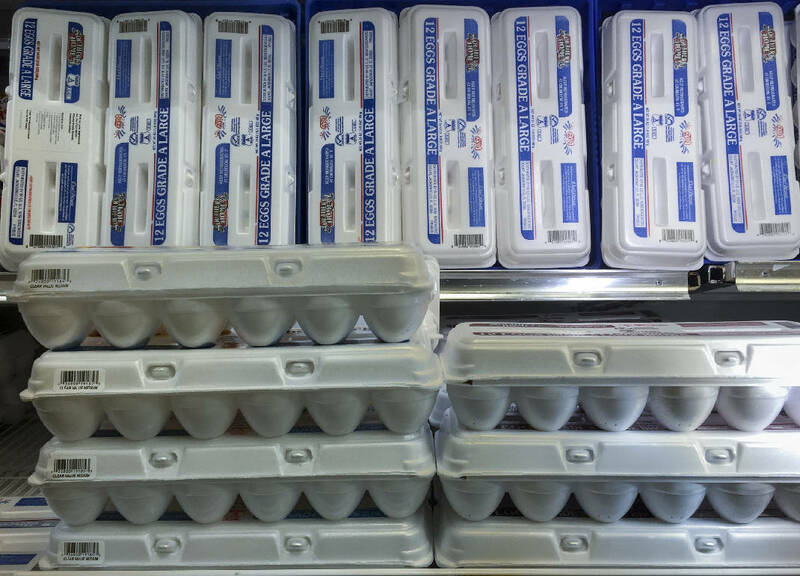 Staff photo by Doug Strickland Cartons of eggs are displayed on the shelves at Bi Lo grocery store on Signal Mountain Road on Friday, June 19, 2015, in Chattanooga, Tenn. Egg prices have been increasing as a result of problems with avian flu in egg-laying chicken populations. Sick chickens make baking a lot more expensive. Last week she made her regular trip to Chattanooga Restaurant Supply to pick up a case — 30 dozen cartons — of eggs for Koch's Bakery, where she works as front-end manager and cake decorator. It's normally a $35 to $45 expense — but not this time. "I paid $80 for the case I bought last week," she said. "I feel the pain, yes." Nichols is feeling the crunch that an outbreak of avian flu is forcing on the American egg industry and its customers. Right now, the virus is primarily affecting flocks in the Midwest and Pacific Northwest. But those regions are home to some of the country's largest egg producers. Tennessee produces around 341 million eggs each year, fewer than any of the eight states bordering it. Iowa is the country's largest egg producer, turning out more than 18 billion eggs a year. As of this week, more than 200 chickens nationwide have been positively diagnosed with H2N5 avian flu, but precautionary measures have led farmers and government officials to kill nearly 50 million chickens and turkeys to stop the spread. And fewer chickens mean fewer eggs, which means prices go up — for everybody. "A lot of that is not under our control," said Brenda Reid, region spokeswoman for Publix. Reid said Publix officials are watching the virus outbreak but are subject to commodity pricing decided by the American egg industry. Main Street Meats sells these pasture-raised eggs at the East Main Street store. As a result of the current flu outbreak, "as a customer, I would say, 'Yes, you have noticed it,'" she said. Reid said Publix officials are looking at possibly adding new egg vendors "in the event this is continual." And it's not just Publix. Most grocery stores around the city were charging $2.50 or more for a dozen large eggs this week. 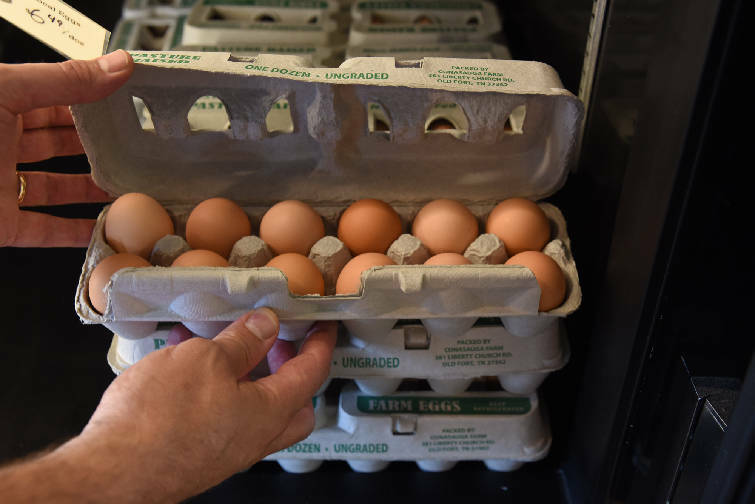 Around 13 percent of the country's table eggs — or eggs sold to consumers — have been affected by the current avian flu response, said Dale Barnett, executive director of the Tennessee Poultry Association. And around 20 percent of liquid eggs — or eggs sold straight to bakers and restaurants — have been affected. Barnett said this outbreak is on pace to have more effect on consumers than any in the last decade. The good news for Tennesseans is no birds here have been diagnosed with the H2N5 virus. Also, Barnett said, the virus is not a threat to humans. "The big message," he said, "is this flu is not a public concern for humans. It's pathogenic to the birds, but not to humans." The name — highly-pathogenic avian influenza — makes it sound more dangerous than it is, he said. Even consuming meat or eggs infected with H2N5 is not likely to result in illness, as long as the food is prepared properly, according to the U.S. Department of Agriculture. But that's not to say the avian flu won't bruise consumers' pocketbooks. Some predictions have the country's poultry recovery lasting for months, or even years. And that's bad news for bakers. "We use eggs in just about everything," said Nichols. "I hope we don't see this going on for two years with these prices, because that's pretty steep for eggs."